Be one of the first to own the much coveted iPhone 6s Rose Gold and have it delivered right at your doorstep. 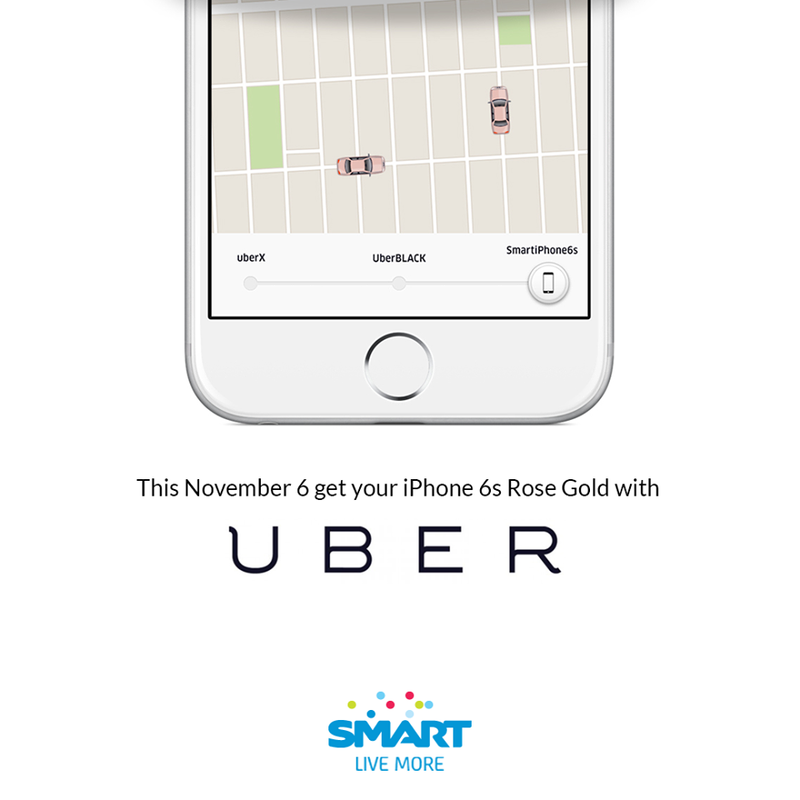 Smart Communications Inc., aims to provide total client satisfaction and teams up with Uber car service to deliver your iPhone 6s in style. Can't wait to get your hands on the much anticipated Rose Gold iPhone 6s on launch day? You can have it especially delivered in style right at your doorstep as unrivaled mobile services leader Smart Communications teams up with Uber, the world's most popular ride-sharing service, for the first ever iPhone midnight delivery service in the Philippines. Available from 12 am to 4 am of Nov. 6, the official launch day of the latest iPhones in the country, the service allows you to request the Rose Gold iPhone 6s (16GB) unit worth Php 35,990 delivered wherever you are in Metro Manila via the Uber app. Just request for a Smart iPhone6s on the Uber app, prepare to pay using your credit or debit card, and get ready to have your new phone delivered to you in style. You can pay in 12-month installment at 0% interest if you opt for a credit card transaction. As an added perk, all iPhone 6s deliveries come with P2,000 worth of Rustan's gift certificates! "Smart is thrilled to partner with Uber to bring the brand new iPhones to excited subscribers who want to get the first dibs on the Rose Gold iPhone units via the country's first ever midnight iPhone delivery service," said Kathy Carag, Smart Postpaid Head. "Aside from utter convenience, subscribers who will avail of this special service can also look forward to more exciting surprises! This is part of our efforts to give our beloved subscribers awesome Smart Life experience," she added. 5. Click on Request to get the iPhone 6s delivered to you. As soon as you've made the request, you shall receive a verification call from a Smart Representative, who will confirm your purchase and your payment method. Upon confirmation, your brand new iPhone will be on its way. Don’t forget to prepare your debit or credit card (strictly no cash payments) and valid ID to complete the transaction with the Smart Representative. Both plans come with All-Month Surf for 30 months so you can access your favorite sites and apps like Facebook, Twitter and Instagram as well as chat apps like Viber, Messenger and Whatsapp – all on top of your data allowance. Moreover, you also get FREE access to the app of your choice every month throughout your contract, and unbeatable extra perks from Smart's partners like Uber, Airbnb and Zalora. Smart's ZERO handset cashout offer for iPhone 6s at and iPhone 6s is until December 31, 2015. To know more about Smart's unbeatable iPhone plans, visit www.smart.com.ph/iphone.